I need that stat!!! my makeup storage needs an improvement big time. They are super cute! I might see if I can get them. How adorable! I wonder if they're stackable? This is wonderful! I recently found some rectangular baskets at a bath shop for 90% off!!! I grabbed a few and am using them for my skin/body care, and one for the makeup I use regularly. Baskets can be so useful and I love how pretty yours are! Not the typical brown basket look! @JC You could stack them but it wont be practical as these ones don't have sturdy bases, plus it would be harder for you to get to what you need. Those are the cutest storage containers I've seen! Those are cute! I currently have mine stored in a mish-mash of things. Makeup I use regularly in stacked plastic drawer sets and other makeup in metal tins from IKEA. That is such a cute and lovely idea! 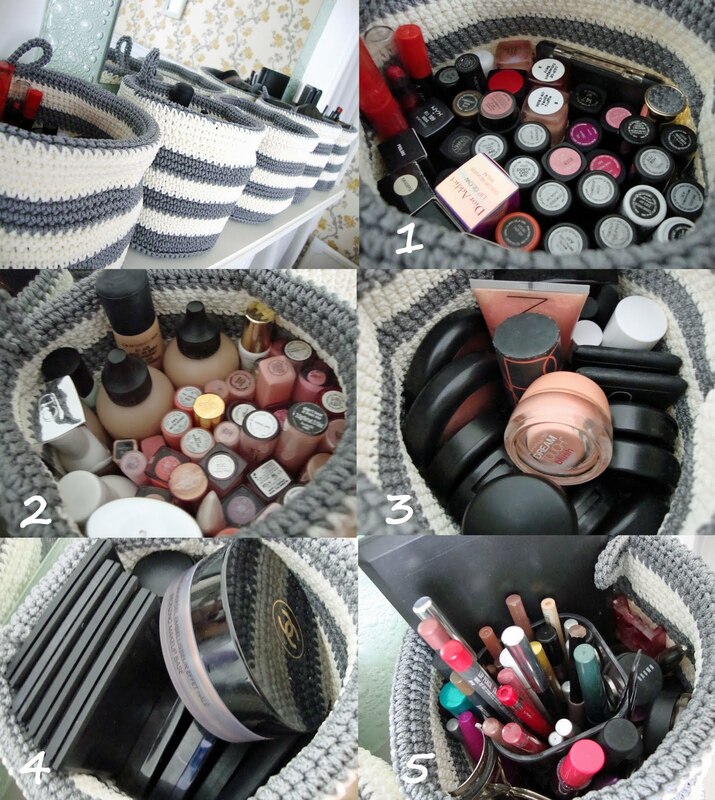 another reason why i love reading your blog because i am storage obsessed like you!! it's great for ideas!!! Oh that's adorable, I love it! This probably sounds weird but I store my lip glosses in small pink glass candle holders.It looks really cool. Love your organizers. So cute! They are so cute! I love them! It's hard to believe all that makeup fitted into those. Godd job! This is such a great idea--they look so cute!! 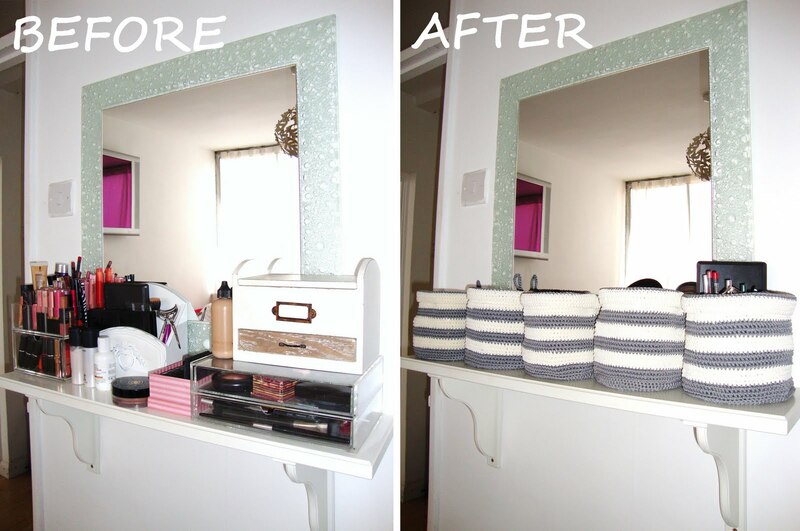 I love your storage tips, you are very inspirational and creative! These are really cute, thanks for sharing! wow, thats really clever and it looks really nice after! Love this idea. It looks soo neat and tidy! So cutes! 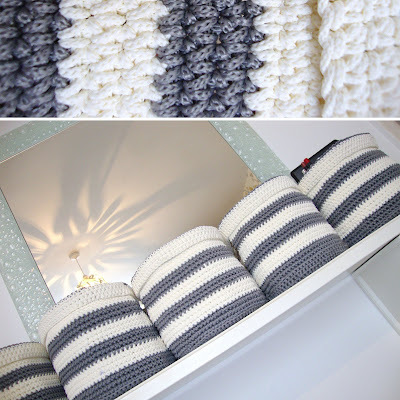 :D They remind me of winter hats but in a cutes granny way! I never thought of turning something like that as storage! I love all your storage tips...you are very creative! Thank you for this post! I hope your pregnancy is going great! I wouldn't be able to keep organized with your method of storage, but it looks nice. I just bought a slim black dresser for mine. I keep lip products in one drawer, eyeshadows in another, face products, brushes, and so on. Just come across your wonderful blog of all things beautiful. Nice storage ideas. i love these, wish i could find something similar! My make-up is stored in little mini drawer sets on my dressing table.. It's not the prettiest way but it's working for now!